Nita Ambani owned the stage with her dance moves. Nita Ambani appeared to be the happiest person last evening as she welcomed guests to their daughter Isha Ambani's engagement party. At the bash thrown by the Ambanis to celebrate Isha Ambani and Anand Piramal's engagement, Nita Ambani showed her dance moves too. The event was attended by the who's who of Bollywood and cricket. Nita Ambani danced to late Sridevi's hit number Navrai Majhi from her hit comeback movie, English Vinglish. 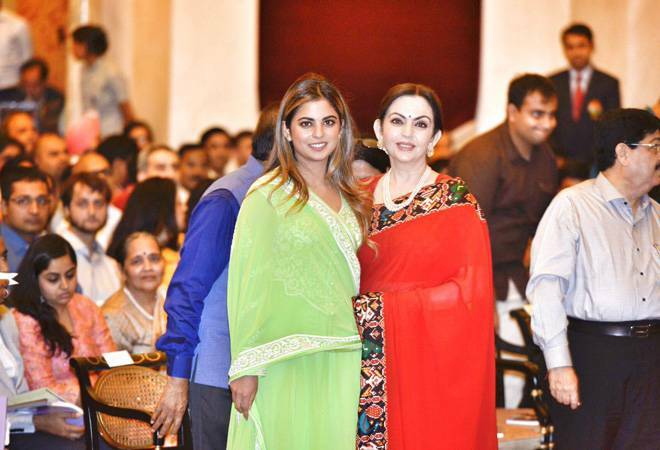 In the video that has emerged from the function, Nita Ambani can be seen performing on a stage, while husband Mukesh Ambani can be seen cheering his wife from beside the stage. Another video has emerged from the same event where Isha and Nita Ambani can both be seen dancing to Nachde Ne Saare from Siddharth Malhotra-Katrina Kaif's Baar Baar Dekho. Isha seems to be following her mother's dance moves, while Nita Ambani owns the stage. Isha Ambani got engaged to Ajay Piramal's son Anand Piramal, who proposed to her at a temple in Mahabaleshwar. Anand, an MBA from Harvard Business School is the Executive Director of Piramal Enterprises and founder of Piramal Realty and Piramal eSwasthya. Isha, a graduate from Yale University is a board member on Reliance Jio and Reliance Retail. She is also the founder of AJIO, an online fashion retailer. They are expected to get married in December. In March this year, Mukesh Ambani's son Akash Ambani also got engaged to Shloka Mehta, daughter of diamond merchant Russell Mehta. They, too, are expected to marry in December.